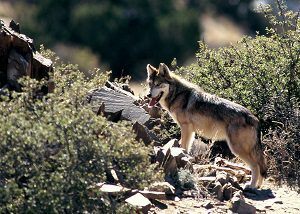 PHOENIX –The success of Mexican wolf recovery across Arizona and New Mexico hinges more immediately on maintaining social tolerance than on genetic diversity, according to a recently published peer-reviewed study. The study was published in Biological Conservation, a leading international conservation science journal. In it, the authors, which include Arizona Game and Fish Department biologists, conclude that maximizing genetic diversity in Mexican wolf recovery must be strategically balanced against impacts and concerns from local communities or the entire recovery program might be compromised. “It has become increasingly evident that recovery of Mexican wolves will need to consider and weigh both the social concerns voiced by local communities and the numbers of wolves required for sustainable populations in the wild,” the study states. The authors state that “cross-fostering” – a technique where captive wolf pups are placed into a wild-born litter of the same age to be raised in the wild – is a viable means for increasing genetic diversity in the wild Mexican wolf population. The practice has also proven successful and helps to reduce potential wolf-human conflicts. One of two wolf pups cross-fostered into the wild Dark Canyon Pack in 2014 is now the alpha female of the Leopold Pack and produced wild offspring of her own last year. A male pup cross-fostered with her in 2014 is now paired with a female creating the Baldy Pack. This is significant because some advocacy groups contend that the best solution to wolf recovery is to simply release additional captive-raised adult wolves into the wild. While that could increase genetic diversity, the study shows that captive wolves are more habituated to humans and thus are prone to getting into conflicts, which erodes public support for the wolf recovery program. The inexperience of captive-raised wolves reduces their overall survival and limits their ability to pass their genes on to the next generation. Equally important for the success of the overall wolf introduction effort is social tolerance of the reintroduction program. Of the 124 documented Mexican wolf mortalities from 1998 to 2015, 53 percent were attributed to illegal shooting and trapping of the animals. In 2016, U.S. Fish and Wildlife Service has confirmed 14 wolf deaths, most of which are still under investigation. It has become increasingly evident that any Mexican wolf recovery effort requires acknowledging social concerns to reach a sustainable population of wolves in the wild. The AZGFD biologists who co-authored the study are Larisa E. Harding, Jim Heffelfinger, Esther Rubin, Jeff Dolphin and Anis Aoude.